England players celebrate after taking the wicket of Australia's D'Arcy Short. AUSTRALIA will need to find a rapid solution to its unsettled batting order to avoid a fourth consecutive bilateral ODI series loss on Tuesday night. 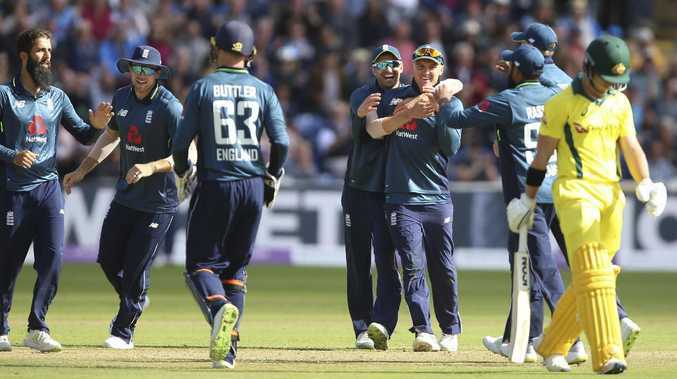 The visitors will face England at Trent Bridge needing a win to keep the five-match series alive, after falling 39 runs short of victory at Cardiff on Saturday. Australia tried to find a way to fit into the side four players who open the batting in domestic cricket, all of which failed to score more than 21 runs with the exception of centurion Shaun Marsh. 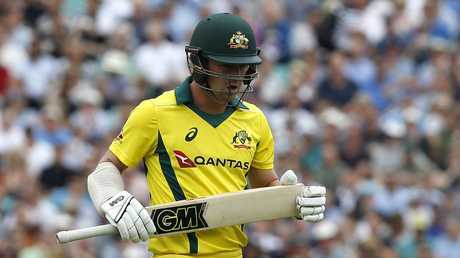 The number of opening batsmen was up from three in the first ODI, where Aaron Finch (19), Travis Head (5), and Marsh (24) failed to fire on Australia's way to a lacklustre 214 all out. Spin brought about the demise of Finch and Marsh, who were both dismissed by in-form all-rounder Moeen Ali. And the trend continued in the second ODI, where spin bowling was responsible for the wickets of D'Arcy Short (21) and Finch (0). 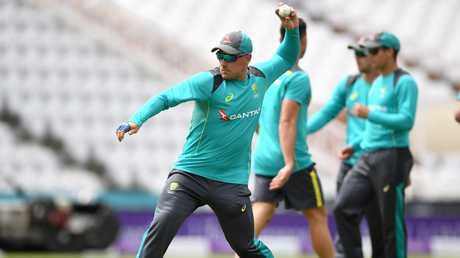 The only other batting option who remains unused this series is wicketkeeper-batsman Alex Carey, who would likely need to dethrone the Australian captain Tim Paine to make his second ODI appearance. Travis Head walks back to the pavilion after losing his wicket for five runs during the first ODI. That leaves Justin Langer and Paine with the same question to answer going into the third ODI: Who opens the batting, and where do the others fit in? 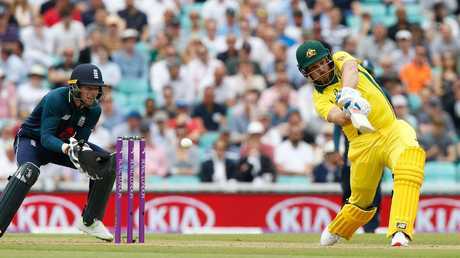 Finch was moved down the order to make room for Short on Saturday night, playing his first ODI innings from outside the opening positions, where he has made 3219 runs at 38.32. He lasted just four balls before he was trapped in front by spinner Adil Rashid for naught. Meanwhile, his opening replacement Short looked uncomfortable in his ODI debut and stuttered his way to 21 before he was caught by Joe Root at first slip off the bowling of Ali. Marsh is the other batsman who has been left out of his favoured opening position, coming in at first-drop in the first two ODIs. Aaron Finch plays a shot to be caught out for 19 runs during the first ODI. The Western Australian veteran has played 38 ODI innings as an opener, making 1432 runs at 38.70. Prior to Saturday, Marsh had played just eight innings at number three - being dismissed for less than 25 in six of those and making 71* and 55 in the remaining attempts. His stunning 131 at Cardiff, however, will likely see him remain in the number three spot, while it's understood Finch will stay in the middle-order. Despite his inexperience batting down the order in ODIs, Finch said he's comfortable coming in at five. "I haven't done it a hell of a lot in one-day cricket but … having done it in T20 cricket over the last 18 months gives me a bit more of an understanding on how to go about it," he said. The Australia vice-captain admitted the batting line-up remains unsettled though, and will likely be continuously shuffled over the next year to find "what combinations work best for the side". "I'm sure there will be a little bit of tinkering," he told the network. Aaron Finch said on Monday that he’s comfortable coming in at five. 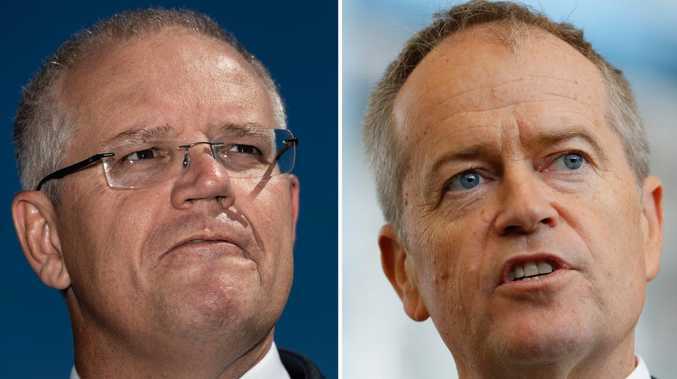 But there is no immediate solution to Australia's middle-order problem, with those on the fringes - such as Usman Khawaja and Chris Lynn - also regularly opening the batting in limited-overs cricket. Lynn played himself into form towards the end of the Indian Premier League season, making more than 45 runs as an opener in three of his last four innings. 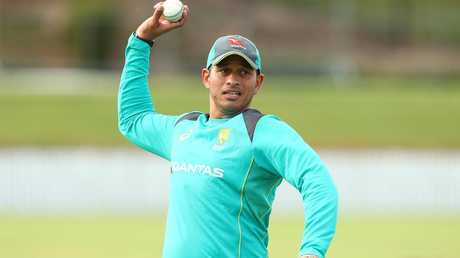 Whereas Khawaja has been most effective in the green and gold as an opener, where he has averaged just over 40 runs in ten ODI innings. He only produced a further 105 runs at 17.50 in his remaining seven innings, which came at first-drop. Those on the fringes - such as Usman Khawaja and Chris Lynn - also regularly opening the batting in limited-overs cricket. Mitchell Marsh could provide an answer once fit, however, regularly coming in between third and sixth across his 44 ODI innings. In those positions, he averages 35.83, although he has recently been guilty of making solid starts but failing to post big scores. He played in each of Australia's five matches against England in January, making scores of 50, 36, 55, 32 and 13, before undergoing ankle surgery in April. Australia face England in the third ODI at Trent Bridge on Tuesday night (11pm AEST).